Video professionals attending the event were invited to go hands-on with the new software at Apple's 1 Infinite Loop campus, some of whom posted what they saw online. Providing a fairly in depth synopsis was FCPX plugin developer Alex Gollner, who chronicled the update's highlights on Twitter. 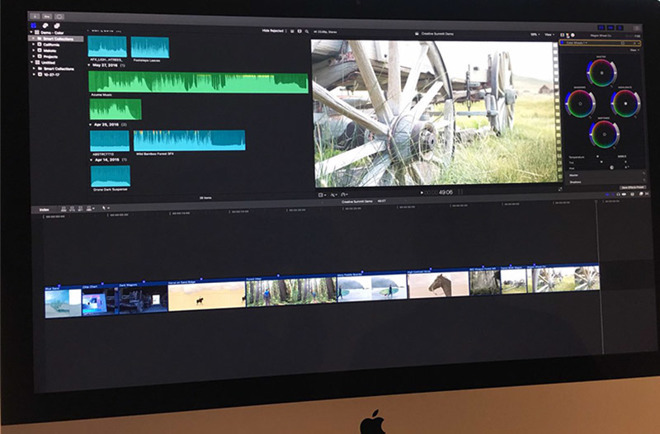 Of note, while Apple is not releasing a new version of FCPX, the 10.4 update is bristling with new features that the company showed off using unreleased iMac Pro workstations. First on the list is support for true virtual reality video. Final Cut Pro's timeline has been updated to support VR footage, including clip orientation, with compatibility for two different head-mounted display feeds. VR integration extends to Motion 5, Apple's motion graphics and special effects software. As expected, version 10.4 will support all the tools offered in noted plugin maker Tim Dashwood's 360VR toolbox. Dashwood was hired by Apple in April. Additionally, the editing package receives support for HDR Rec. 2020 alongside a new slate of color controls including a color picker and color wheels. Users who own the latest iPhones, like iPhone 8, 8 Plus and X, will be able to open 4K HEVC footage in FCPX timelines. HEVC, also known as H.265, is a video compression protocol that promises to halve file sizes while maintaining superior image quality. Apple adopted the codec in iOS 11 and macOS 10.13 High Sierra. Apple has not announced a firm release date, but says the next version of FCPX will be available some time this year. More information about the software is expected to come from Apple itself in the near future. Final Cut Pro was last updated in May when version 10.3.4 saw release. The professional editing suite is available for purchase from the App Store for $299.99.